I have reviewed few PSUs in past two years or so mostly all were higher end expensive computer PSUs and I am constantly asked by many to suggest a budget gaming PSU or review one. I have few budget PSUs with me and was for long willing to test them but didnâ€™t have a good idea or inspiration for an article. But recently I got news about Cooler Masterâ€™s new PSU lineup the â€œMasterWattâ€ and â€œMasterWatt Liteâ€ series of PSU, offering new design and features with improved performance and reliability. I was more interested in MasterWatt Lite series as they would be having lower price spectrum. I contacted guys at Cooler Master India to confirm and was surprised to know that MasterWatt Lite 600 is indeed a under Rs.5K price tag product. 600 + watts and with a under Rs.5K of price tag, is the PSU every budget gamer or pc builder looking for. 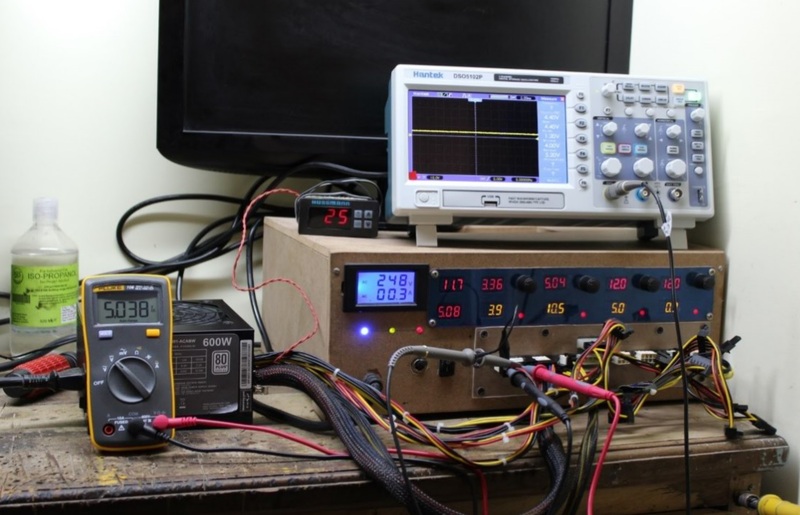 This gave me an idea to do a comparison between PSUs with 600 + watts of power and are under Rs.5K. I already have Corsair VS650 and Antek VP650 with me, and when shared the idea with Cooler Master India, I also got a sample of Cooler Masterâ€™s MasterWatt Lite 600 PSU. So now about this article. This comparison is not about the marketing features of these three PSUs (For that you can find respected product links at the end of this article), but rather about the features, product performance and reliability which is more important for a budget buyer. 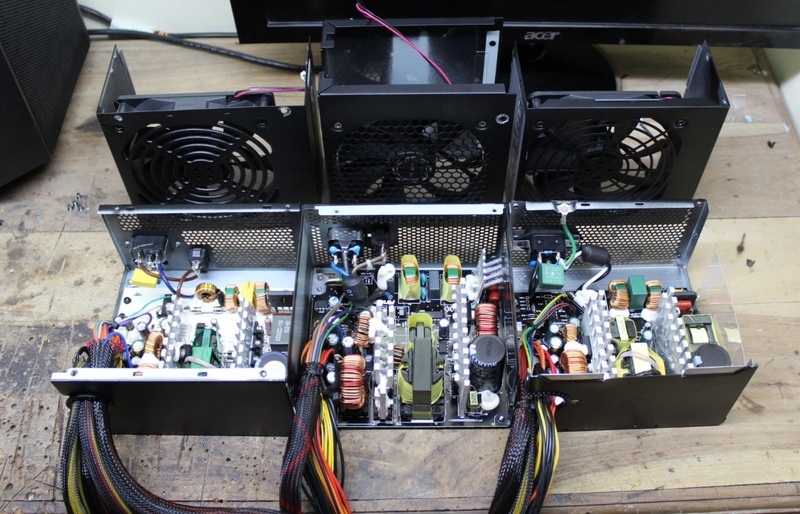 I will be doing a detailed inside-out run on these PSUs and will be giving each a point (at a scale of 1 to 5, i.e. BAD to GOOD, not EXCELLENT as these are budget PSUs) at every segment of this article. 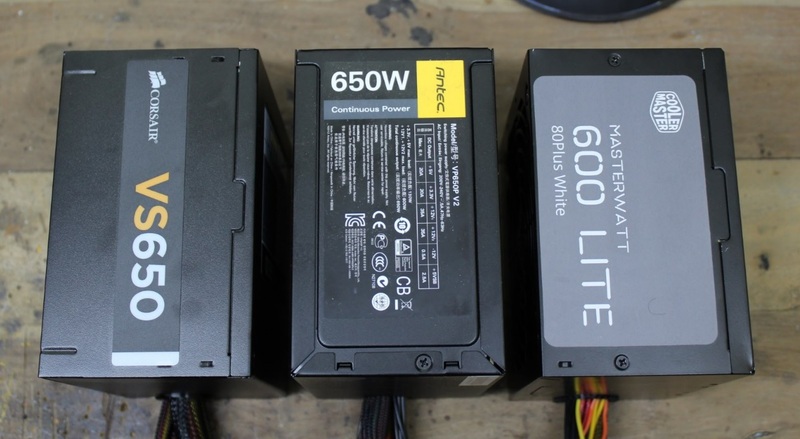 In the end we can club these points together to find which PSU is best among theseâ€¦ Simple. Now letâ€™s begin the comparison. What you get out of the box. 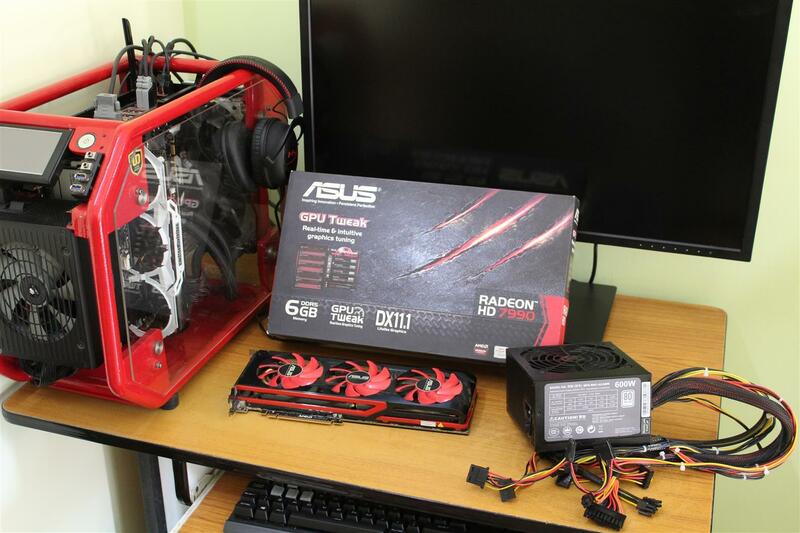 All PSUs comes in a cardboard box with PSU, manual and decent AC power cable. PSUs are build with requisite quality and thickness of iron sheet for rigidness and minimization of interference. All three PSU are having a 120mm fan for cooling and a power ON/OFF switch along with Main IEC power connector. Now letâ€™s open these PSU to see what all they have for us. 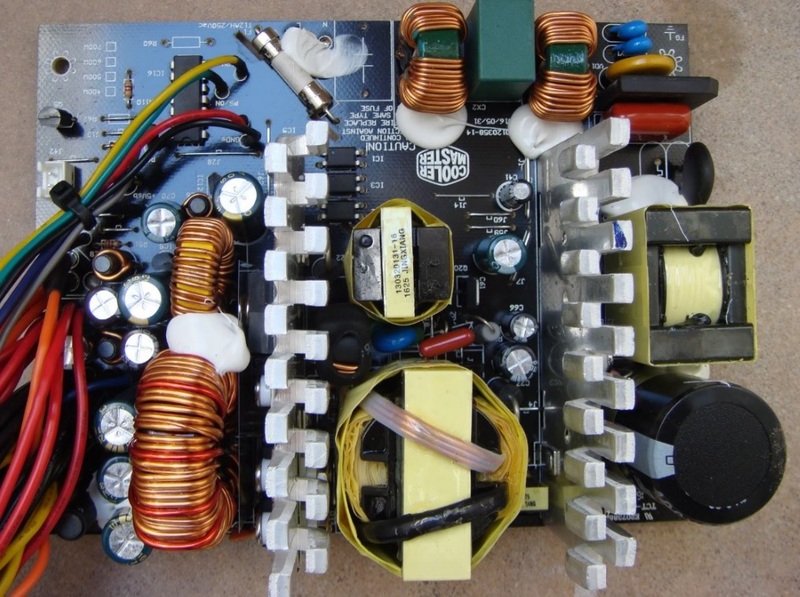 Note very few of PSU brands manufacture their own entry level PSU. Here only Cooler Master manufactures itâ€™s MasterWatt PSU, remaining two are OEM. Corsair have CWT as OEM and Antec goes for Delta Electronics. Component details are segregated as following. Transient filter starts right from the IEC connectors via wires wrapped around ferrite ring to the PCB (Corsair is have a separate ferrite coil on the PCB) fulfilling all the transient filtering needs, components namely two CM chokes and two pairs of X and Y caps. Unfortunately there is no MOV (Metal Oxide Varistor) present on the Antec PSU, so this PSU is susceptible to spikes coming from the power grid. First look on the PCBs gives an impression that the build quality of Antec seems to be very good, but later found Antec to have the thinnest and poorest PCB. When I started de-soldering the components off the Antec PCB whatever low temperature I tune on my soldering iron, the copper traces pops off with the components on Antec PCB. So I decided not to de-solder any components off Antec. Too bad. 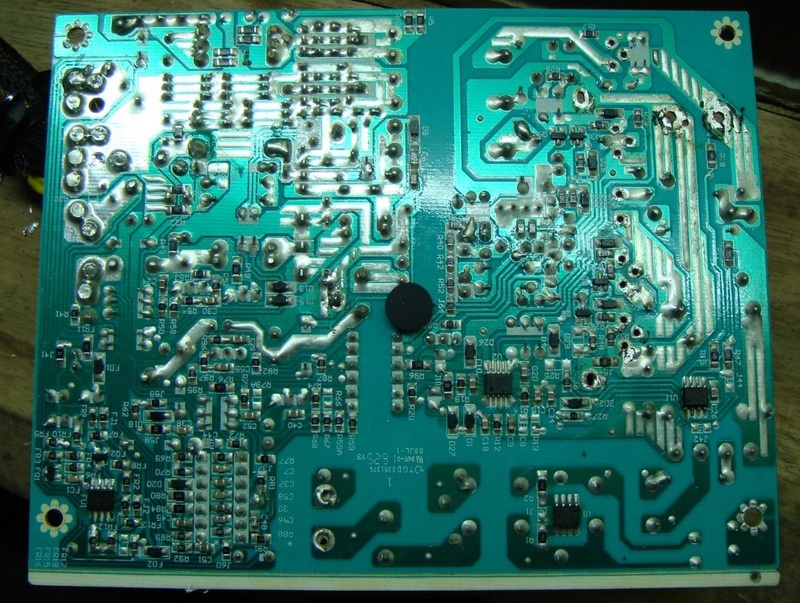 Remaining two PSU have good quality PCB. Corsair PCB Front and Back. 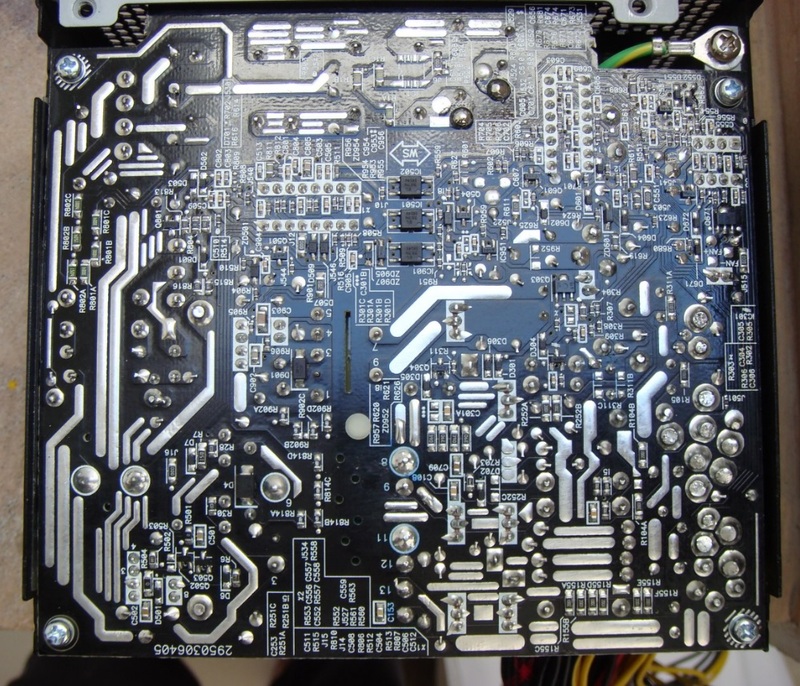 Antec PCB Front and Back. 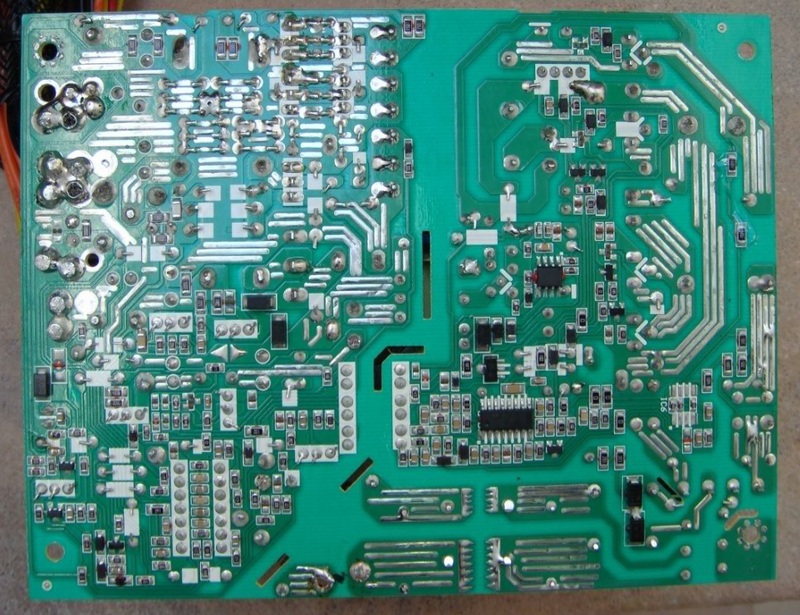 Cooler Master PCB Front and Back. Both Corsair and Cooler Master is having the same GBU606, a 6amp bridge rectifier, where as Antec is having 8amp GBU8K bridge rectifier that too on a separate heatsink. 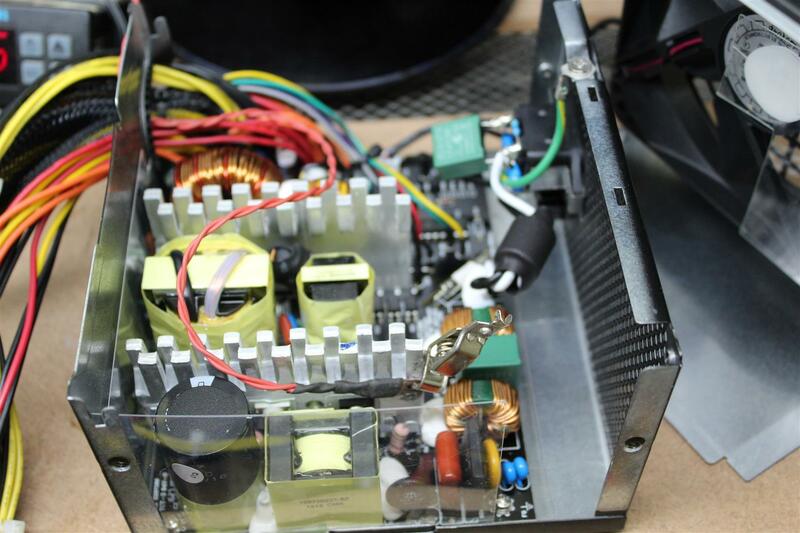 Though at 600W loads cooling of bridge rectifier is not needed, but extra cooling is always welcome. 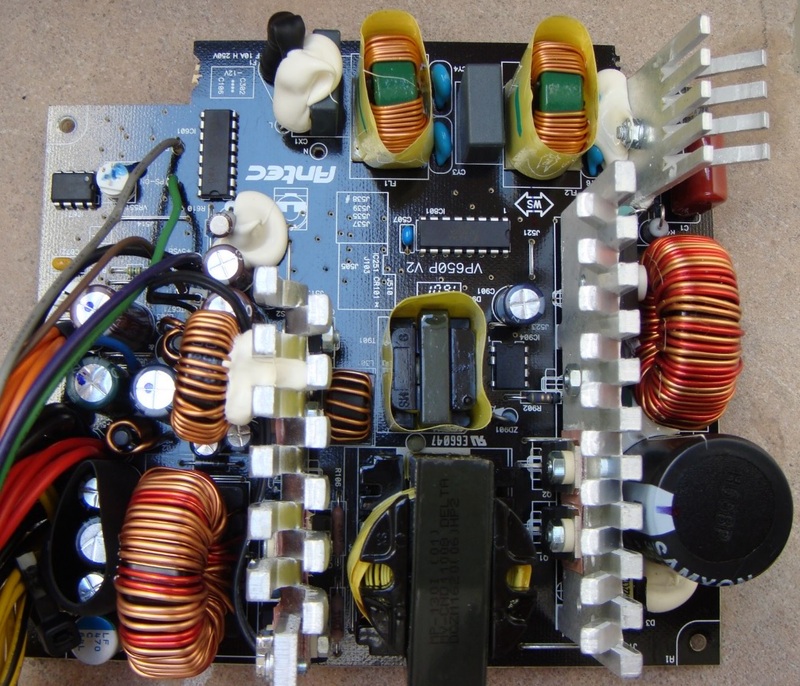 High voltage DC from Mains AC is filtered by big hold capacitor in a PSU. This is one of the key component depending for smooth DC-DC conversion. And this is most likely the top most candidate responsible for any PSU failure. I am personally disappoint to have a 85C ratting main cap on all three PSU, although 85C is doing the job, but please a 105C rating main cap is the best. Below table give the technical details of each cap, giving us an idea about its quality and help in giving points. Beside all the datasheet figures, I know with my last 12 years of electronics experience the Elite cap are the most busted caps I have seen among these three. ** Dissipation factor (tan d)or DF is defined as the ratio of the ESR and capacitive reactance. It is the reciprocal of quality factor Lower DF means higher quality. Both Antec and Cooler Master have a single MOSFET, where as Corsair have two MOSFET(in parallel) in APFC stage along with APF Diode. 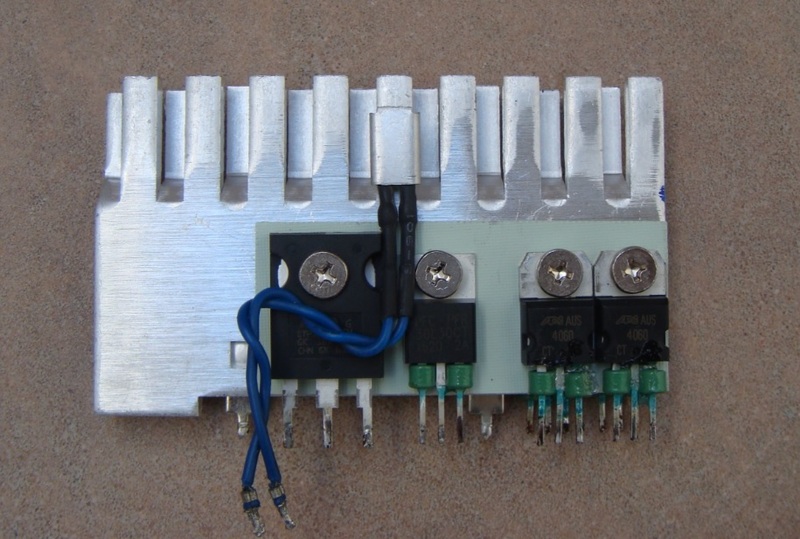 Main switchers are two MOSFETs all adequate for mentioned ratings. 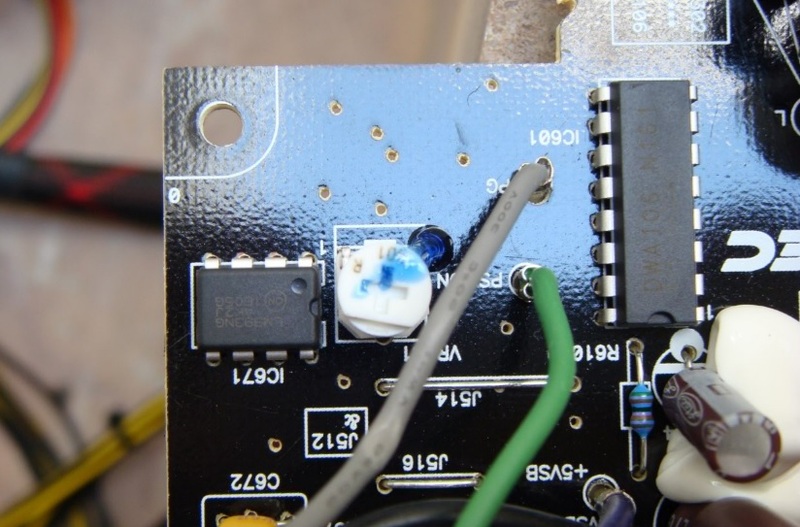 Different manufacturers used different SMPS design with different controllers and protection chips. Every chip is a well designed package with lot of embedded features suitable for a power supply. 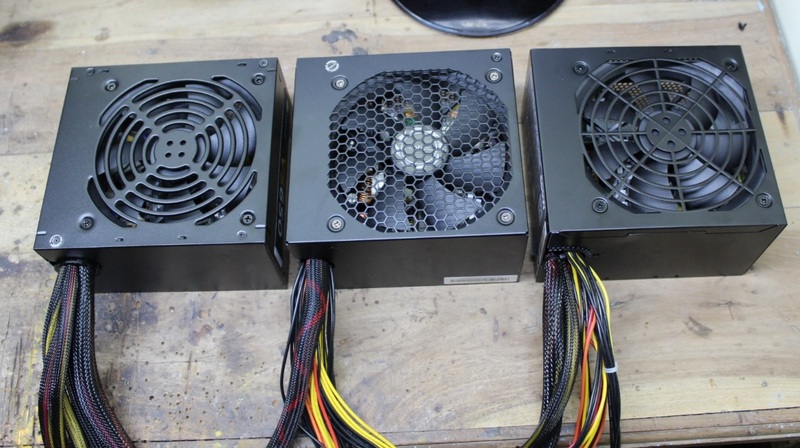 All three PSU uses equivalent chips but with slight different implementation. All ATX PSUs have a separate 5v Stand-By circuit, which used to mostly power the Soft-Start segment of the PSU and Motherboard. Antec and Corsair used similar type of chip for their Stand-By segment. 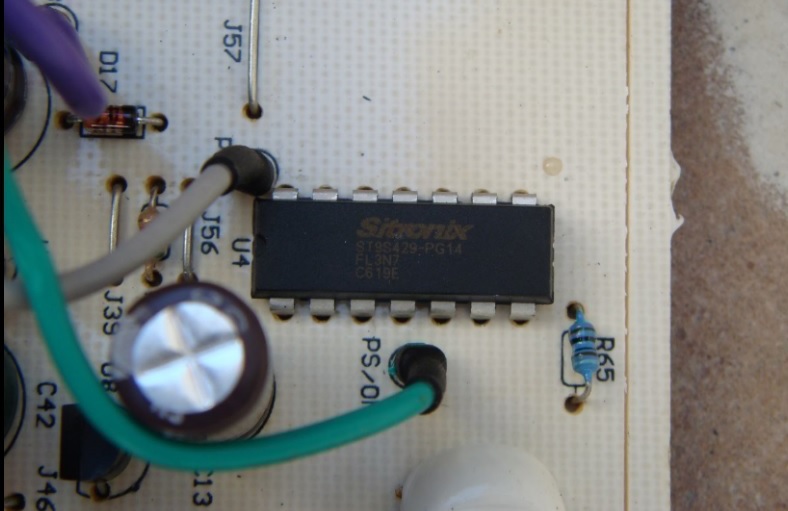 TinySwitch Single chip Switcher solution, which incorporates High voltage MOSFET and control circuitry on one dye. Cooler Master used separate switching controller chip and discrete Power MOSFET and other power components for its Stand-By segment. 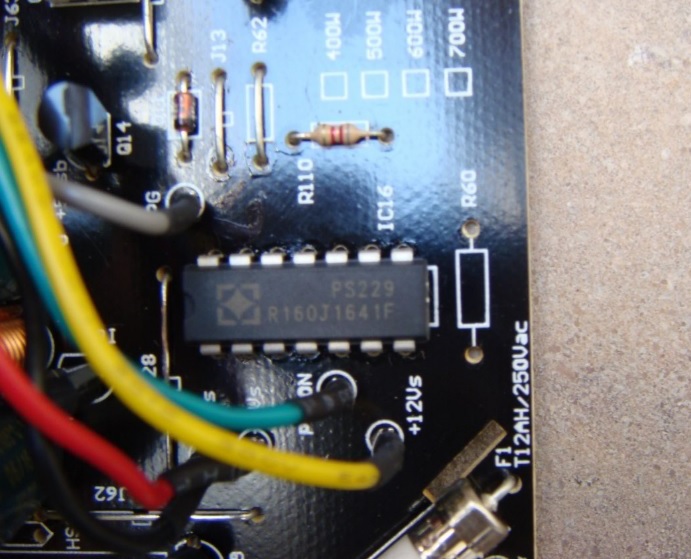 Design is good and more reliable than single chip solution. 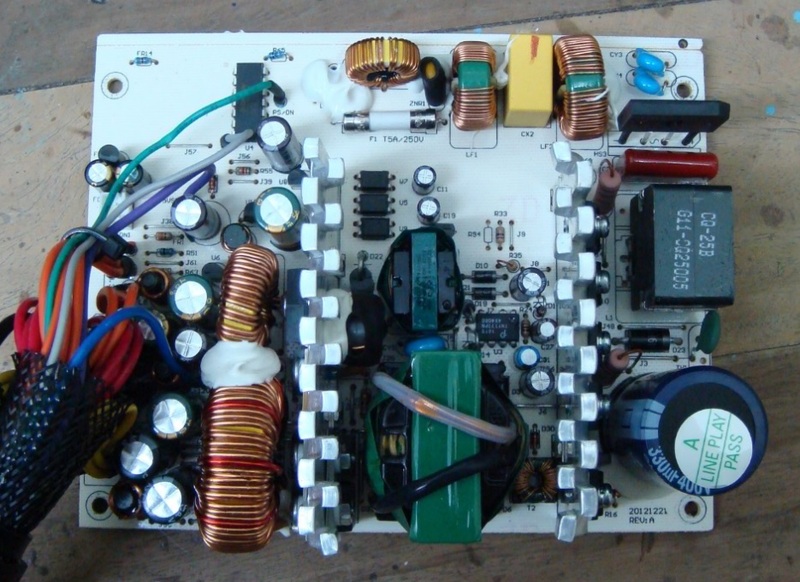 All PC Switching mode power supplies uses dual center tap Schottky rectifiers in secondary stage and even installed in parallel to double the current handling of the DC- DC conversion. We will judge the PSU according to the total Ampere ratings of the Schottky rectifiers for each DC rail output. 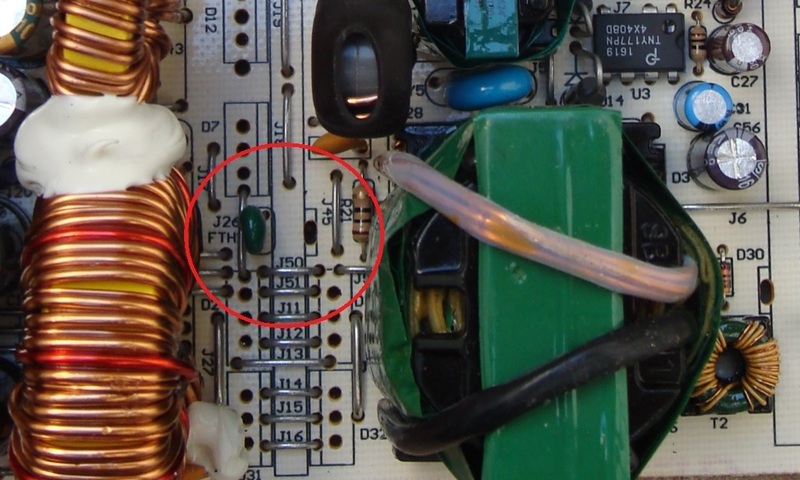 Antec ** Secondary Schottky rectifiers canâ€™t be de-soldered due to poor quality of Copper trace bonding on the PCB. 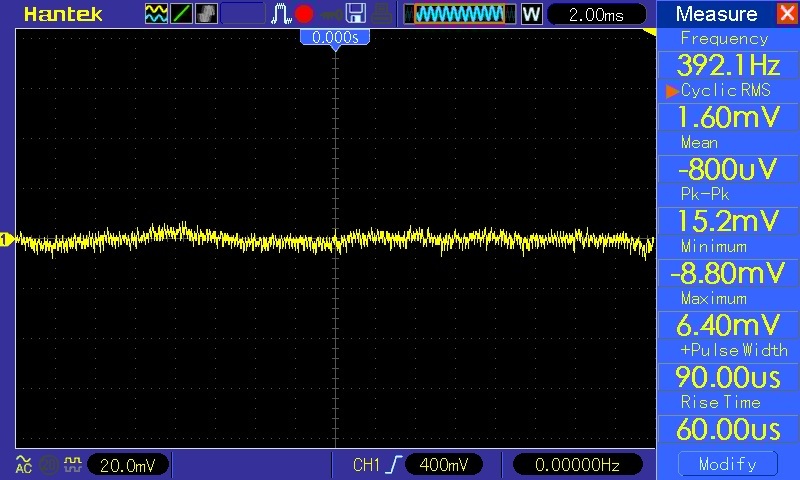 All 12v and 5v Schottky rectifiers are having small green ferrite rings over the DC output leads. This helps in filtering out the high frequency edge off the DC rails and improves ripple management. Great job Cooler Master for this. These PSUs are designed for budget market, so you will get decent brand caps at secondary filter stage. For decent filtration minimum of 2200uf filter caps should be used in DC-DC convertors. So we will judge this segment according to total capacitance on each voltage output. 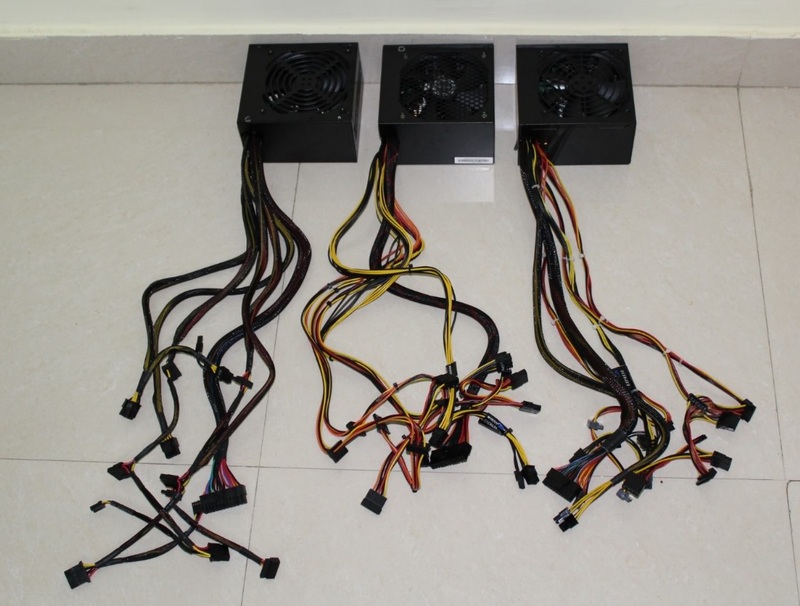 All secondary caps on these three PSUs are 105C rated. Being this a budget unit I was first surprised to see a Solid Cap and premium Japanese Rubycon Caps on Antec PCB. But looking closely found that the solid cap and Rubycon Cap were just installed on 12V rail and remaining 5V and 3.3V was having Taicon and LTec caps. This is weird, its seems like these premium caps are installed for a reason or better say a â€œPATCHâ€, as later I notice significantly high voltage ripple on 12V rail. It seem engineers were trying to fix high ripple issue due to some design or PCB layout fault, but still problem is not fully rectified. Hmm ..
All PSU have decent protection chip onboard for Short circuit, over voltage and over current. 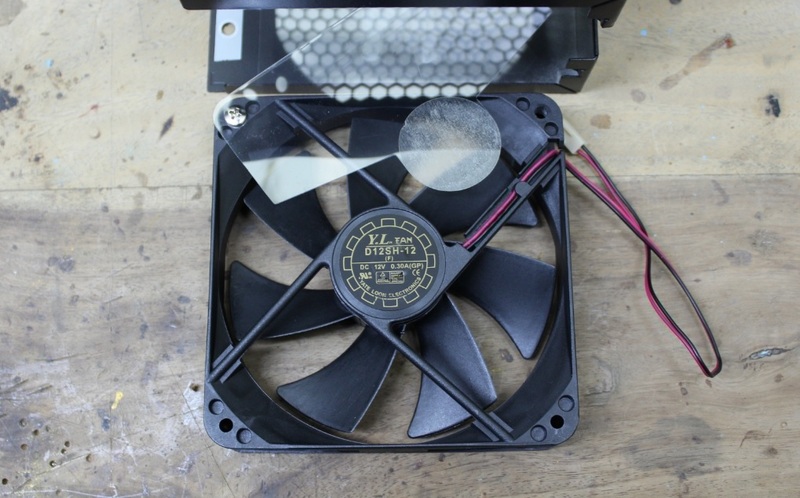 Speed of fan is controlled via a simple thermostat and power transistor circuit. 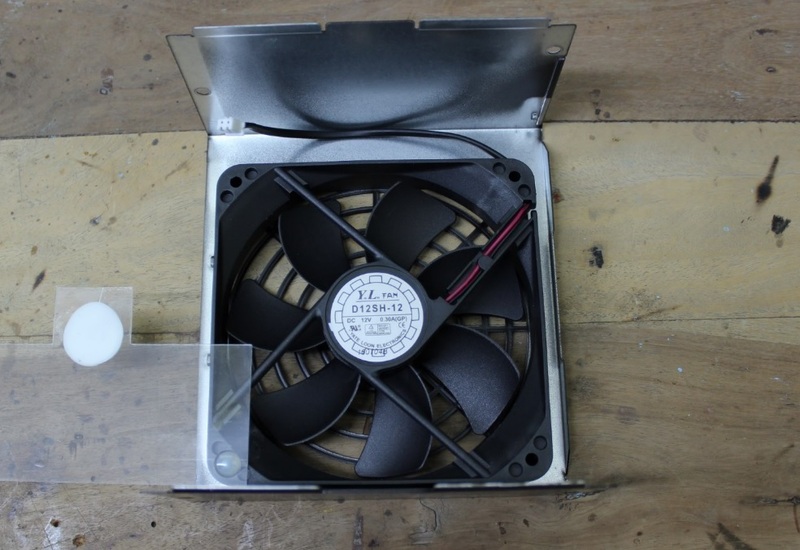 For fan to react according to the internal temperature thermostat should be properly installed onto the heatsink. Both Cooler Master and Antec have done it right, but unfortunately that is not true for Corsair. Below you can clearly see that thermostat is just soldered onto the PCB and is having a gape of about 1-1.5mm from secondary heatsink so real temperature is never registered by the thermostat and fan will not ramp-up when needed the most. 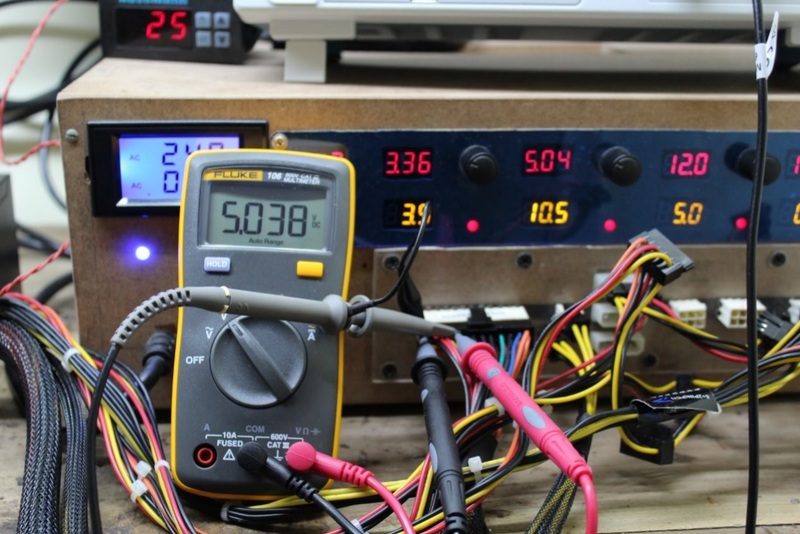 This results in higher junction temperature on power devices and over all higher operating temperature of the PSU, lowering the overall PSU life and I think this is the main reason of high failure rate of this PSU. 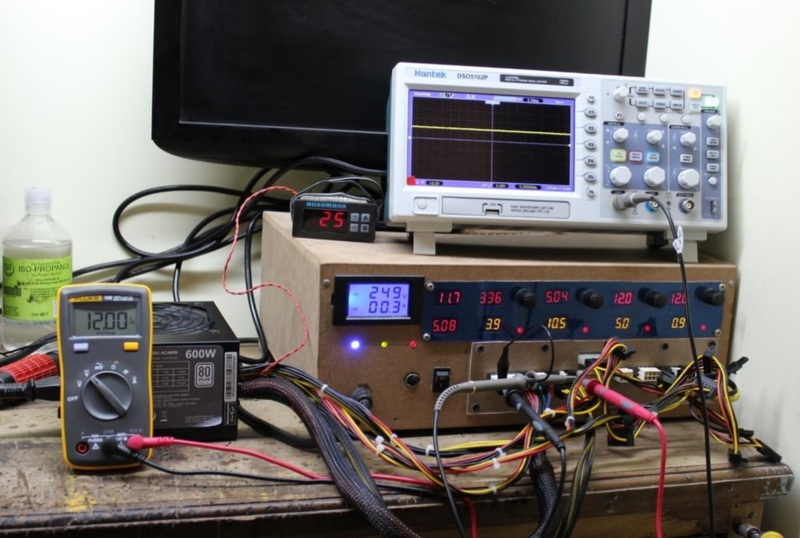 During this test we try to pull more than specified power of the PSU. So at certain point PSU should turn OFF by itself showing proper working of Overload protection or should die showing absence of any protection. 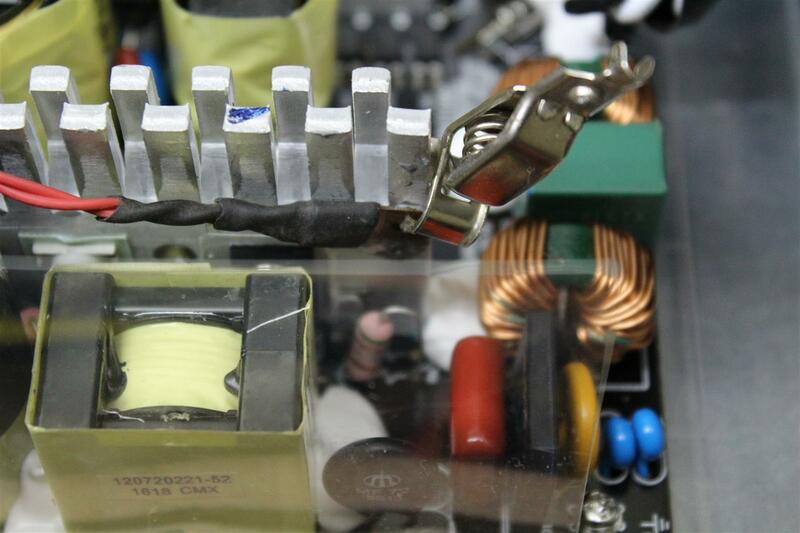 Below is the absolute Max power we were able to pull from these PSUs. 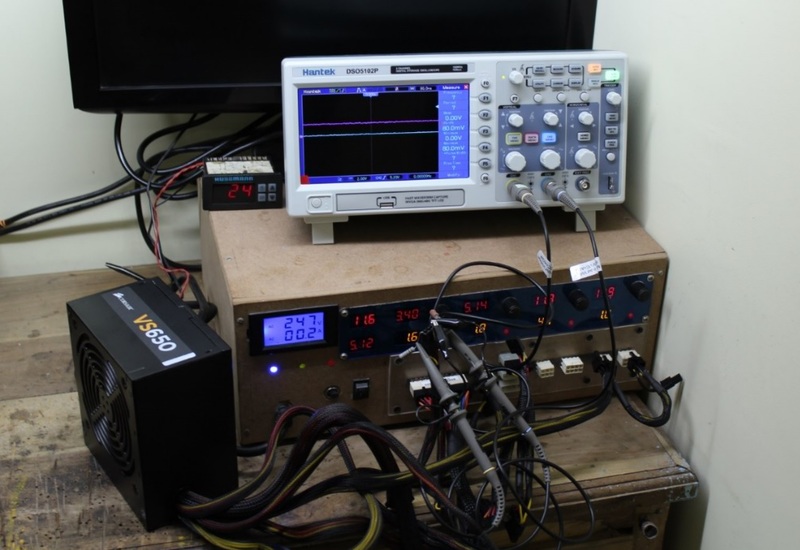 We measured range of ripple using oscilloscope at maximum rating of the PSU for 12v, 5v and 3.3v supply output in Pk-Pk(mv). ATX specification for Ripple Pk-Pk(mv) for +12v is 120mv and for +5v and +3.3V it is 50mv. So letâ€™s seen which PSU gives lowest ripple. 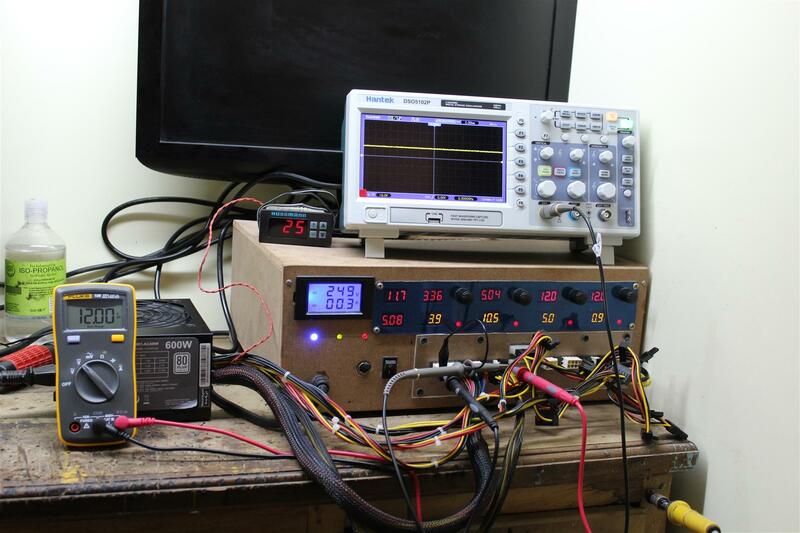 We measured change in voltage of different rail from 20% load up till the overload protection of the PSU is triggered. ATX specification for Voltage range min. to max. is as following. 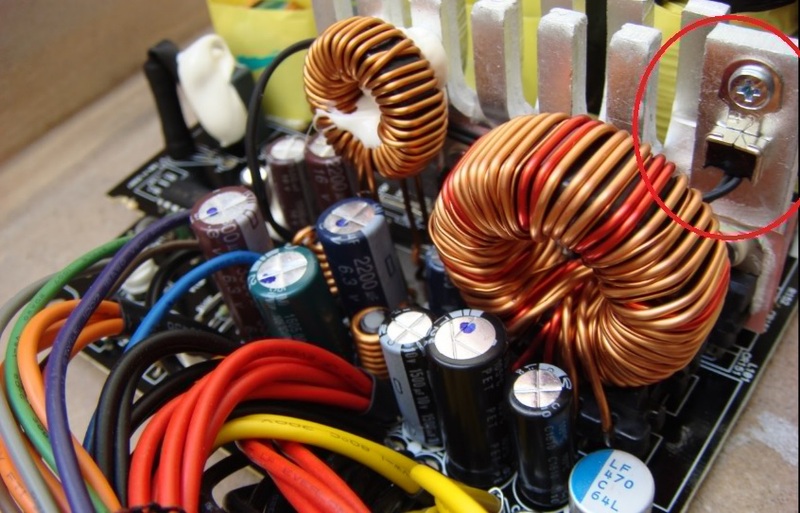 Starting and end voltage readings with drift in voltage is listed below. 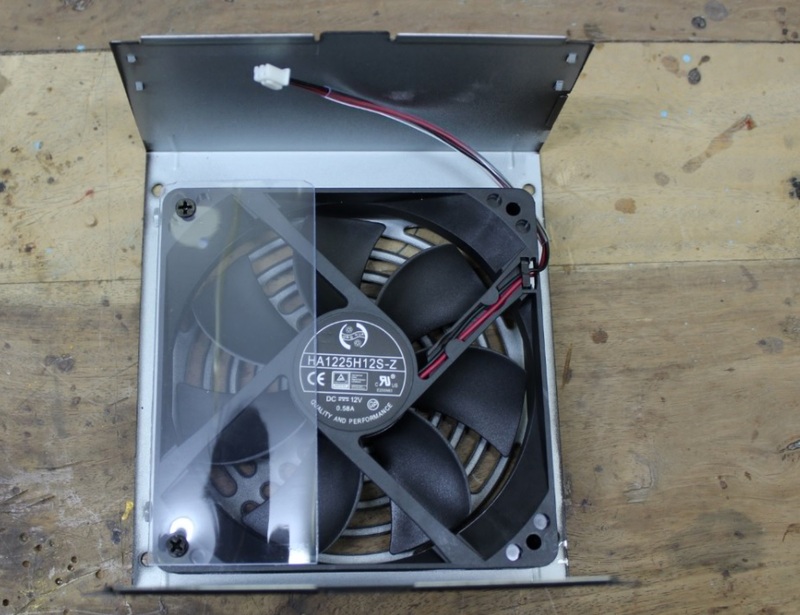 To measure exact thermal performance of the PSU, we mounted our thermostat with proper thermals onto the Primary heatsink of the PSU and top cover with fan is closed properly. Before and after every test PSU and test equipments were turned OFF for half an hour. 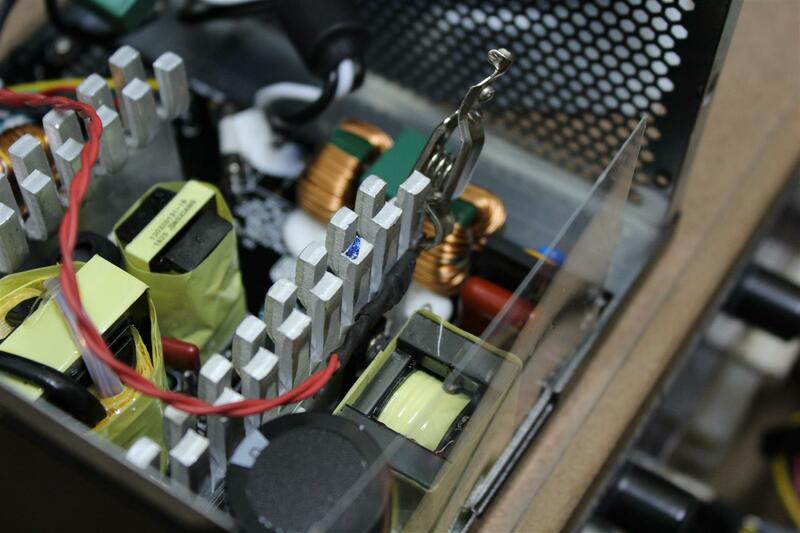 500w of load is applied to each PSU for duration of about 5 minutes and change in temperature is measured. Starting and end temperature readings are listed below. And as I mentioned earlier in Cooling section, due to thermostat placement, the primary heatsink of Corsair PSU is touching 88C not good. 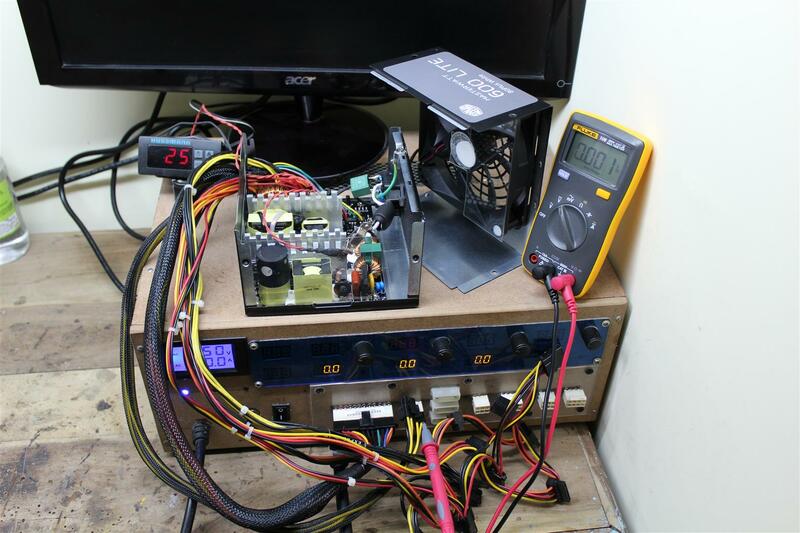 To test these PSUs in a real world scenario I installed an old power hungry graphics card, the HD7990 and ran 3Dmark2006 and measured voltage at PCIe power connector. 12v reading was good at this test. 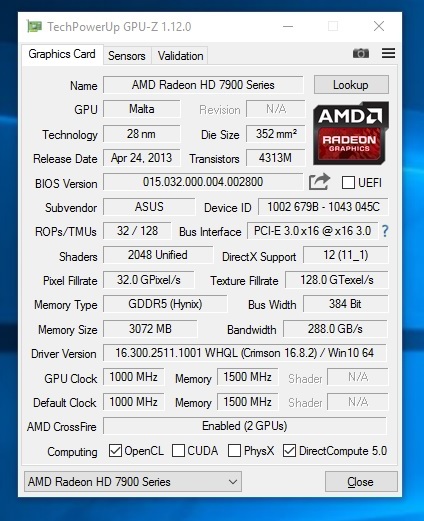 At stock GPU setting everything went fine for all PSU, but when GFX is overclocked closed to 1100MHz, the Corsair PSU gave a BSOD and computer restarted. There not much to say now, the final scores is self explanatory. 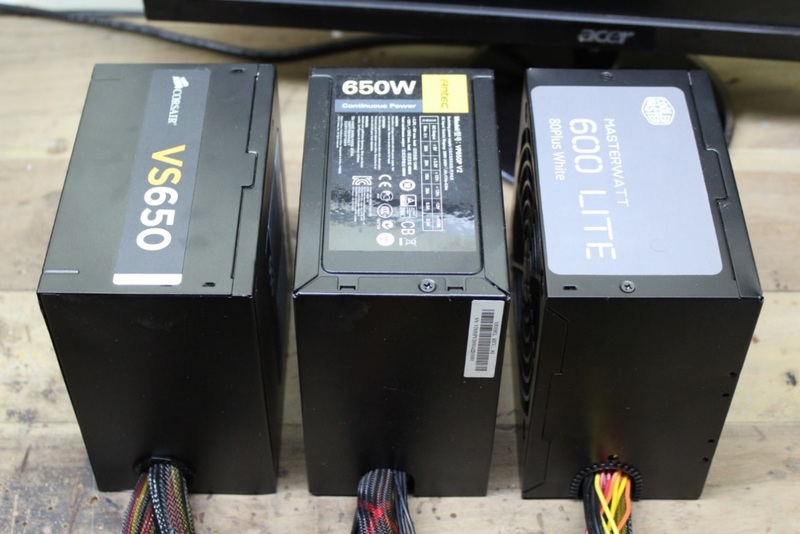 Still considering the price, Cooler Masterâ€™s new Master Watt Lite series PSU is definite a game changer in the segment and will create a good competition and may inspire other brands to redo their budget PSU segment. Which is actually good for the market as latest graphics cards are becoming more and more power efficient, a 600W PSU is sufficient for mostly all single card gaming build and if we get good price to performance ratio from a product itâ€™s always welcomed.